Vodafone has now released their plans and deals, we have done a new comparison between all three, full details at the link below. 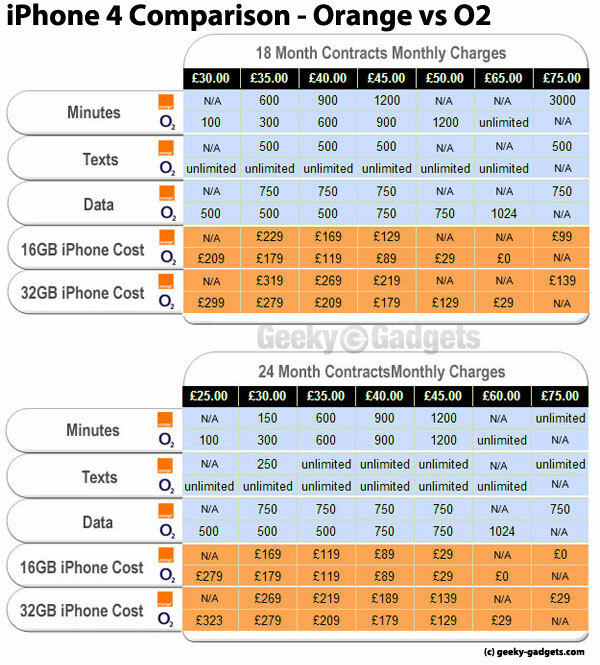 O2 has just released their official pricing for the iPhone 4 here in the UK, yesterday we had Orange with their official plans so we have put together a handy comparison for our readers so they can decide which is the best deal for them. You will be able to see in the table below which plans are the best to suit your needs, and also how much the iPhone 4 will cost to purchase up front, on the cheapest 18 month contract. As soon as we get some more information from, Three, T-Mobile, Tesco and some official prices from Vodafone we will update the table so our readers can compare all the deals. You can see full details of the O2 plans here and full details of the Orange plans here.